Being a big fan of smoking my meats and fruit I sometimes like to just start smoking or slow cooking immediately without the hassle of charcoal or if I happen to run out of liquid propane (LP) gas which is why most people use electric smokers as opposed to charcoal or propane. 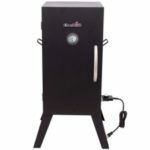 Looking for top quality electric smokers in 2019 can be a challenge, so how do you find the best electric smokers for your family’s enjoyment while also saving money? Well check out our top-rated products below and take your time … no reason to rush through this. Take a good look at each smoker and then decide which is your flavor! For this category, we listed brands that meet our criteria; Masterbuilt and Smoke House are among our favorites. Go through the list below and read our reviews for each. Remember to click BRAND to get to a brief intro (below the table) then click through again for a full review. Have fun! 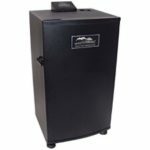 This little gem of a smoker is ideal for the beginner or novice smoker. 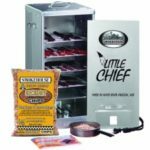 It is the Little Chief Front-Load Smoker by Smokehouse Products and is Made in America for those who like to support our country … Go America! Folks like this front loading smoker for its size and convenience. It has a small footprint and can be portable too. Features consistent low temperature setting with a 250 watt heating element. For smokers that is not much power but for smoking jerky, fish, fruit and thin strips of meat, it will do. 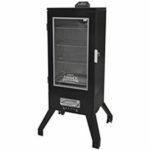 If you purchase this unit, you’ll also get a recipe/instruction booklet and a 1.75 pound bag of fresh Chips n’ Chucks wood fuel that has a nice touch of Hickory flavor and it’s under $100 … can’t beat that! 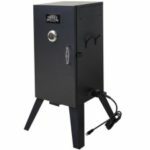 Click here to read more about the Smokehouse Little Chief Front-Load Electric Smoker. Here is one unit we couldn’t leave out. 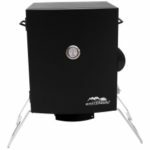 It is the Smoke Hollow 36″ Digital Electric Smoker with Window. 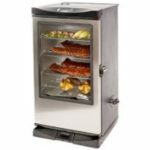 This is a great unit as it has proven to smoke food at even temperatures with its powerful 1,500 watt heating element. 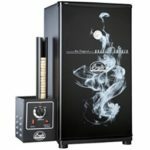 You’ll have plenty of space smoking with its large 3.0 cubic ft. chamber One cool feature about this Smoke Hollow appliance is the new digital electronic controls with LED display showing you all you need to know including Temperature, Time and a Fast Smoke option. You can check up on your smoked goods by looking through the easy-to-clean viewing window. If the heating element malfunctions, it is replaceable. Click here to get the full review on this Smoke Hollow digital smoker. This Masterbuilt unit is probably one of the top-of-the-line smokers for its class. Standing over 40 inches high and 975 square inches of cooking space, you’ll be able to smoke plenty of food to last a week or perhaps a large backyard party! This unit model #20075313 features a nice clear window for viewing, a front digital controller which is also controlled by RF for convenience, an integrated thermostat for consistent even heating and a sweet side loading system for adding chips. I have a buddy who owns this unit and he really like it. He can play with his kids of watch the game while checking status of his smoking with RF remote control. This smoker is one the best in my opinion, because the ease of which one can smoke. Just put in your meat, plug it in, set the controls to your liking and it goes to work. 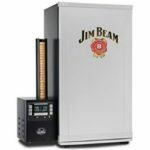 Click here to read more about this Masterbuilt Electric Smoker and see if it is your perfect match. 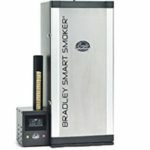 Last but certainly not least on this list of the best electric smokers is the Original Smoker by Bradley Smoker model BS611 and is one to take a good look at. This small footprint of a smoker is a unique meat smokehouse that utilizes a auto-feed mechanism and a smoke generator that allows even and consistent heating. The bisquettes are auto-fed into the smoker and burn for approximately 20 minutes each to help keep temperature steady which helps eliminate high temperature gases, acids and resins which can mess with the flavor of the smoked food. The unit can also be used as a slow cooker or a slow roasting oven for additional smoking/cooking options. You’ll get 4 removable and adjustable racks, user guide, tray and drip bowl. The bisquettes are sold separately. Click here to get the full review on this Bradley original smoker.